A drive through the Arroyo Seco is a ride through history. Some call the Arroyo Seco Parkway the starting point for Los Angeles car culture. It was the first “freeway” in the West and an engineering marvel of its time. Add to that the distinction and imprint of historic Route 66 and you have the makings for the perfect adventure by car. By 1920, Los Angeles was already under the spell of the automobile. Although well-developed interurban trolley lines were enabling the city’s sprawling character, the automobile was widely recognized as the future. Anyone caught in the 5 o’clock crush downtown would say the future had already arrived, as thousands of gridlocked cars kept the trolleys from running on time. Traffic congestion was a problem with which city planners were already engaged. Since the city was a nascent metropolis at the dawn of the automobile age, it was better positioned than any other city in the nation at that time to plan future development around the car. It did so only gradually, however. Various regional plans, beginning as early as 1907, called for first an overarching grid of Parisian-style boulevards, then a network of landscaped parkways, and finally, as the Second World War approached, a region-wide system of limited-access highways that, for better or worse, became a model for the rest of the nation and indeed the world. The first link in this system would be a 6.2-mile stretch of highway called the Arroyo Seco Parkway, which straddled the design line between parkway and freeway. It ran primarily along the water course of the Arroyo Seco, a tributary of the Los Angeles River that snaked southward from the San Gabriel Mountains north of Pasadena’s Rose Bowl through the Arroyo Seco canyon and into downtown Los Angeles. Upon its completion in 1940, it was designated an alignment of Route 66 becoming the first stretch of the Mother Road to run over a modern, limited-access highway in the nation. 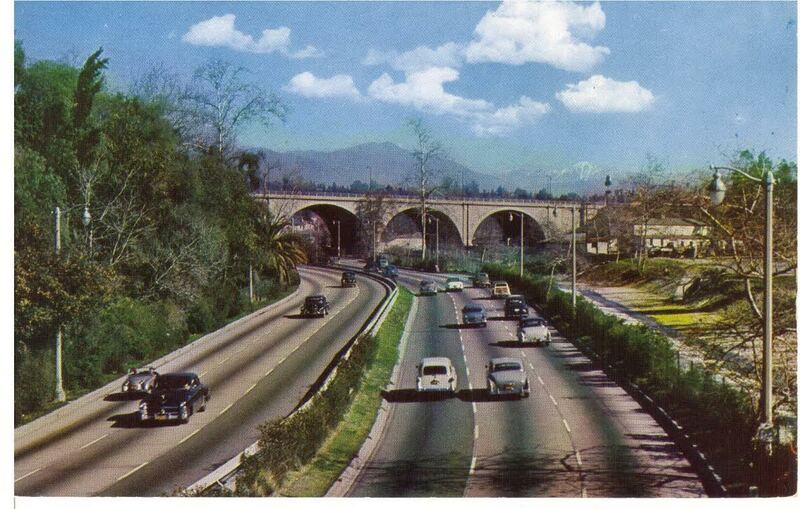 If the spread of the freeway concept, eventually embodied by the national Interstate Highway System, spelled the beginning of the end for Route 66, the Arroyo Seco Parkway still stands as a remarkable piece of urban transportation history and holds a unique place in the story of Route 66. 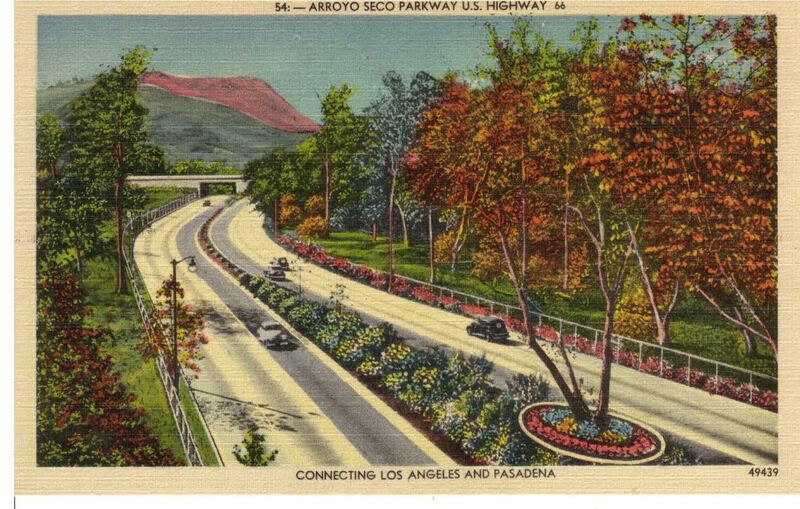 The final form of the Arroyo Seco Parkway proved to be a hybrid of the scenic parkway aesthetic and the then-developing idea of a high-speed, limited-access freeway. Grade-separated overcrossings for existing streets, combined with on- and off-ramps (woefully short by modern standards) placed it squarely in the freeway camp. But the fact that it was heavily landscaped with native plants, and that it ran through dedicated parkland for much of the route in Los Angeles, including going through Elysian Park near downtown via a series of four tunnels, gave it much of the character of a parkway. These are the only known tunnels along the entire route of Route 66. To the contemporary observer, it feels much more like a parkway, despite many compromises to the landscaping for safety purposes over the years. As you travel the route, pay particular attention to the many bridges under which the Parkway passes, including the graceful 750-foot long steel historic Santa Fe’s Arroyo Seco Railroad Bridge (now the Metro Gold line) that spans across the entire Arroyo Seco and passes 100 feet overhead. Most of these bridges maintain their historic integrity, and their varied construction styles present a very different design aesthetic than more contemporary freeway architecture. 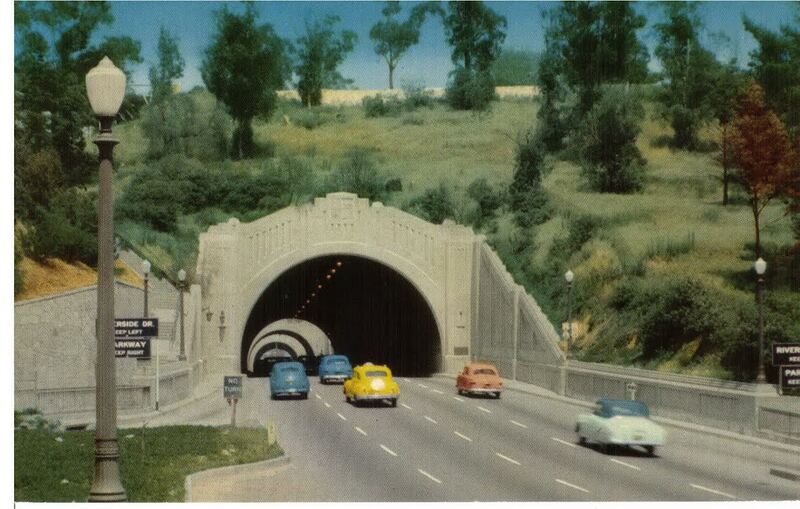 This is even more the case for the four Figueroa Street tunnels that carry northbound traffic through Elysian Park. The Art Deco design of the tunnels marks them unmistakably as from another era, and you will immediately recognize them from countless film and television productions. There is a gateway sign welcoming a northbound traveler to South Pasadena constructed of arroyo stones taken from the watercourse that fits the region’s importance to the Arts & Crafts Movement. Travel along Route 66 during World War II, which the U.S. entered just a year after the Parkway was completed, was light, and the bulk of the traffic along the new alignment would have been local. But as travel boomed after the war and the Route 66 experience began to grab the national imagination ever more tightly, those who sojourned along it to the Pacific experienced the Arroyo Seco Parkway as a shining new example of the future of highway travel in America. Speed and convenience, the driving forces behind the automobile’s rise earlier in the century, were now reflected in highway design. If this had the ultimate effect, as many would argue, of disconnecting highways from their local context, few stretches of road can make you feel more rooted in a place than does the Arroyo Seco Parkway. The Arroyo Seco Parkway (California State Route 110) runs northeasterly from the Four-Level Interchange with U.S. 101 just outside downtown Los Angeles (mile post 23.69) to East Glenarm St. in Pasadena (mile post 31.89), CA. It is a National Civil Engineering Landmark, a National Scenic Byway, and the first of just two California Historic Parkways (the other being S.R. 163 through Balboa Park in San Diego). In 2011, the Parkway and associated features were listed in the National Register of Historic Places as the Arroyo Seco Parkway Historic District. Also of interest is N. Figueroa St., which parallels much of the Parkway just to the west. Figueroa carried the previous alignment of Route 66 beginning in 1931, and after completion of the Parkway was Alternate 66. This is the main street of downtown Highland Park (a district of Los Angeles) with destinations associated with Route 66 to visit and explore. Traveling both today provides telling views of two different historical experiences along the Mother Road in Los Angeles and the Arroyo Seco region of Southern California.